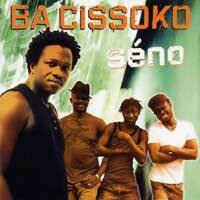 2009 release by Guinean kora player Ba Cissoko and his band. Born in Guinea Bissau, he moved to Guinea Conakry, eventually working with Kourou and Sékou Mbady, who now play bass, kora and electric kora in the ensemble. Hot, hard and defiantly modern. The Guardian writes "This third album takes a step back towards tradition, however. There are still bursts of sonic wizardry - wah wah kora, growling fuzz guitar - but the spirit of change is as much in the use of Latin, funk and reggae flavours."